Pretty flowers aren't produced so we can show them off in vases -- they serve the purpose of attracting such pollinators as bees, butterflies and hummingbirds, which enable them to produce seeds for the next generation. 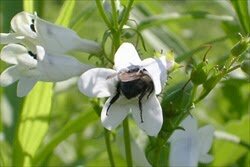 Now, confirming scientists' assumptions for years, a new Cornell study has proven that such pollinators are agents of natural selection in flowers -- at least in the foxglove beardtongue (Penstemon digitalis) plant. "It was assumed that pollinators drive evolution on floral traits because pollinators prefer certain floral characteristics," said Andre Kessler, assistant professor of ecology and evolutionary biology and senior author of a paper published recently in the journal New Phytologist. "In this species, we found that pollinators are the agents of selection on flower morphology [a flower's physical characteristics]," he added. "These findings are important because it is only by understanding the agents of natural selection that we understand why evolutionary change occurs," said Amy Parachnowitsch, Ph.D. '10, the paper's lead author and a former graduate student in Kessler's lab. To test their theories, the researchers allowed bees and other insects to pollinate the flowers of 150 beardtongues in a field; they also hand-pollinated every flower on another 150 plants in the same field. Since the hand-pollinated plants were not dependent on pollinators, they acted as a baseline of natural selection by other forces to which open-pollinated plants could be compared. The researchers could then assess whether pollinators were exerting natural selection on seven floral traits tested by comparing the open-pollinated with hand-pollinated plants. If pollinators were driving natural selection on floral traits, then they would have found stronger selection in the open-pollinated plants. In fact, they found that insect- or open-pollinated plants showed statistically stronger selection for two traits: larger and more flowers. The results definitively showed that pollinators were the agents of selection for both these traits. The researchers also found that for the number of flowers in open-pollinated plants, a phenomenon called stabilizing selection was at work -- just as it isn't good for human babies to be born too big or too small, it was best for plants to have an intermediate number of blossoms in the open-pollinated plants. Common sense suggests it is always better to have more flowers because having more flowers often leads to more fruits and seeds. However, Kessler said there can be a cost for plants having too many large flowers -- lots of large, showy flowers boosts the odds that flowers end up pollinating other flowers on the same plant. Showy displays can also attract herbivores that eat both seeds and flowers. The researchers suspect that the stabilizing selection by pollinators keeps the beardtongues from evolving to have ever-bigger displays and, thus, plants avoid inbreeding.